The British Horse Society has been named as Equine Charity of the Year at the first ever Liverpool International Horse Show. 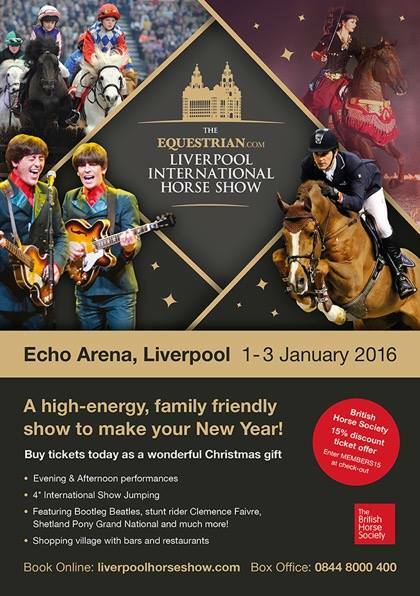 The show takes place at the Echo Arena in Liverpool from 1 to 3 January 2016, and features international showjumping and stunt riding, as well entertainment for the kids and performances from The Bootleg Beatles. Tickets prices start from £16.28. It's a great way to kick off the new year, and using the code MEMBERS15 at the checkout, you'll get 15% off your ticket purchase! You can find a full outline of what's on when at the Liverpool International Horse Show website.